That’s exactly what you’ll find at the Merriman’s in Waimea on the Big Island. Restaurateur and Hawaii regional cuisine expert Peter Merriman’s establishments are well known and loved and for good reason. 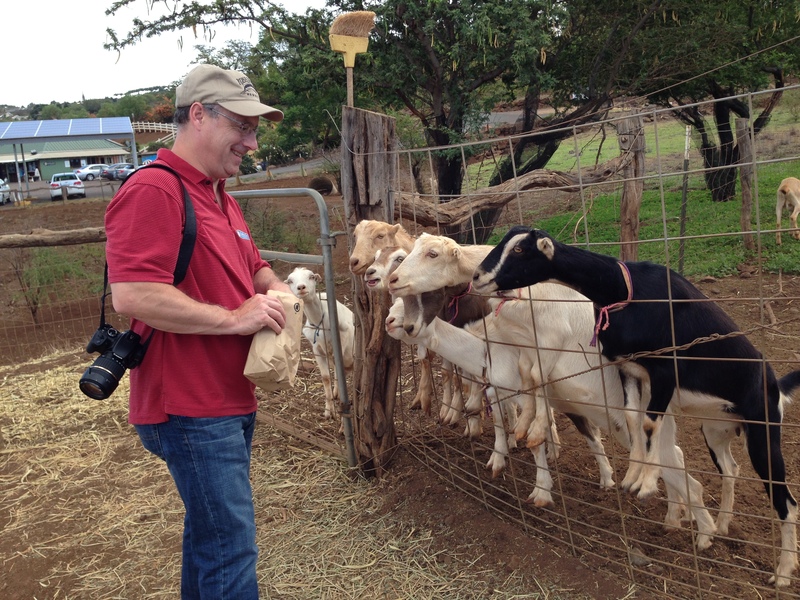 Merriman is known as the original locavore and for more than 25 years he has been a champion for local farmers, fisherman and ranchers on the Hawaiian Islands. My respect for farmers is immense. In the Midwest, we suffered from severe droughts in 2012 and 2013. This spring, we are dealing with the wettest year since 1871 with three to five inches of rain predicted for today alone and the threat of severe flooding. Today, we may break a 60-year record for rainfall in a 24-hour period. Farmers are always dealing with conditions completely beyond their control. And yet, they go on. Which brings me back to Peter Merriman and the concept of Hawaii regional cuisine. Interestingly, I recently learned that Merriman got his start at the Mauna Lani Bay Hotel and Bungalows, a place of which I am extremely fond of and have raved about in earlier posts. The story goes that Merriman arrived from the mainland with one suitcase, plans to stay for a short time and so he took a job at the Mauna Lani as a cook. Two years later, he was named executive chef and the rest is history. 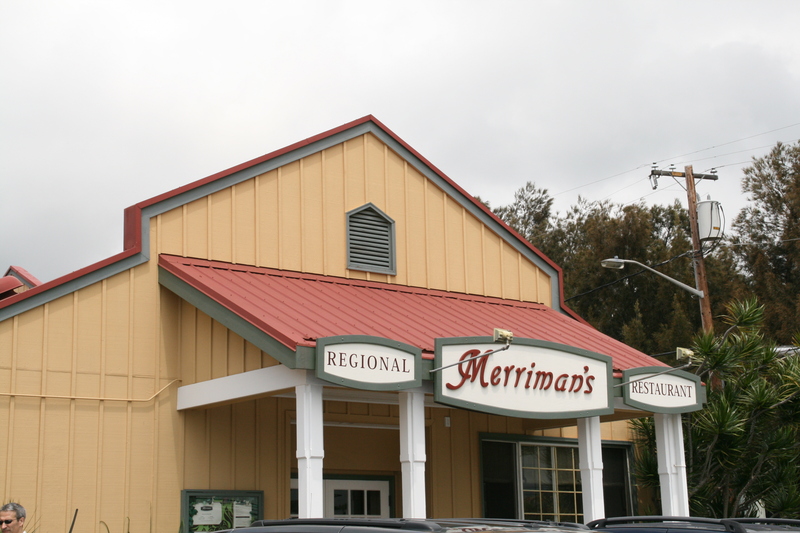 In 1988, Merriman’s opened up as his signature restaurant in Waimea. 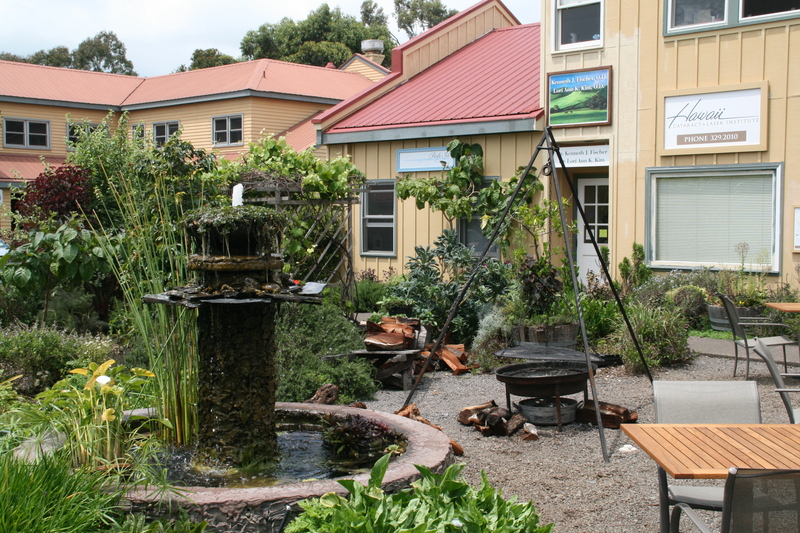 Waimea is a charming, upcountry town on the Big Island. The overwhelmingly positive and well deserved reviews came flowing in soon after Merriman’s opened from the New York Times, San Francisco magazine and on and on and on. 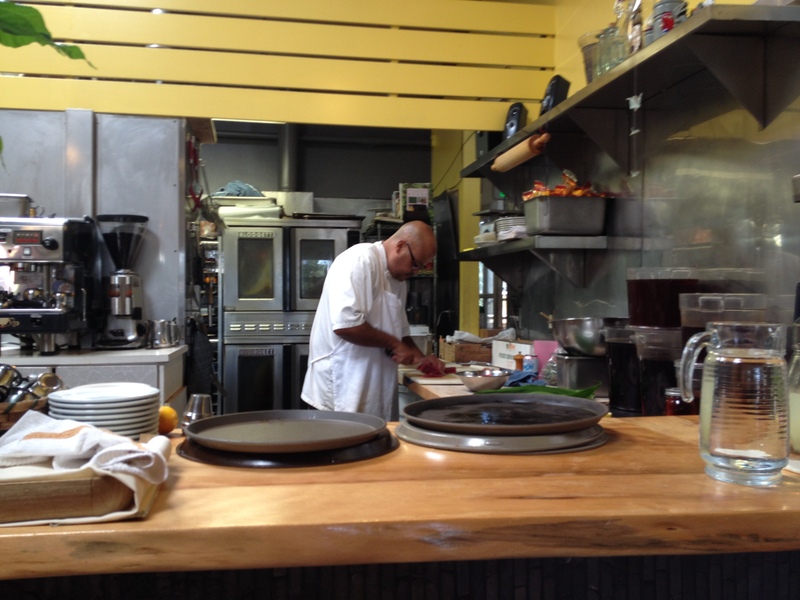 He was one of the chefs who put Hawaii on the map as a foodie destination. Over the years, he expanded to other islands, including two additional locations for Merriman’s Kapalua on Maui and Merriman’s Fishhouse in Poipu on Kauai. In 2014, he opened a new venture called Monkeypod Kitchen, with locations on Maui and Oahu, which I previously wrote about here. A hula dancing waitress and live Hawaiian music for lunch on a Friday? Yes, please! 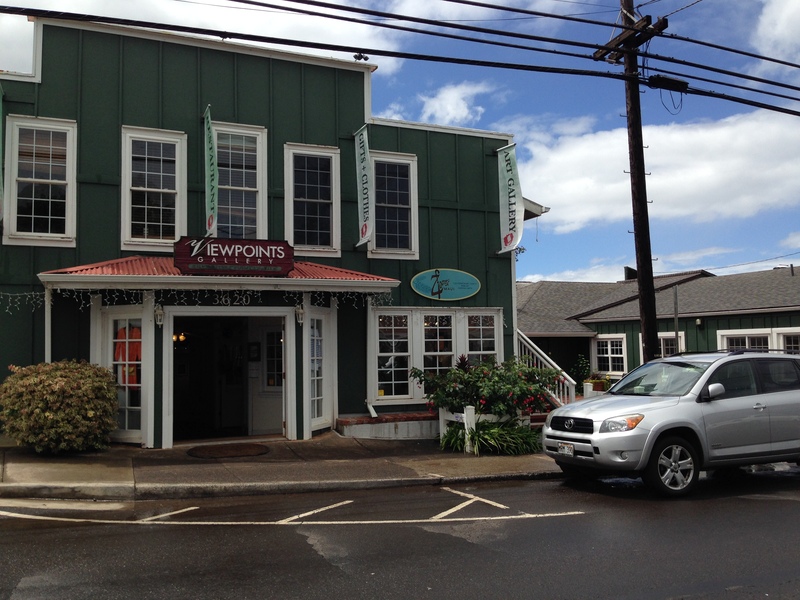 This past March we visited the original Merriman’s in Waimea for lunch on a Friday and it was as wonderful as ever. The minute we were seated our waitress told us that we were in luck as they have live music on Fridays. It got even better from there: One of the waitresses graced the dining room with a hula to accompany the music—a true Hawaiian dining experience. Looking out the window from our table, you could see the kitchen garden. It doesn’t get any fresher than that. We were amused by a father and his elementary school-aged daughter seated at the table next to us. She asked to be excused for a minute and stepped outside for a quick walk through the garden. We saw her sneak a leaf of lettuce for an appetizer. If that isn’t a sign that the produce is fresh and tastes like all produce should, then I don’t know what is. 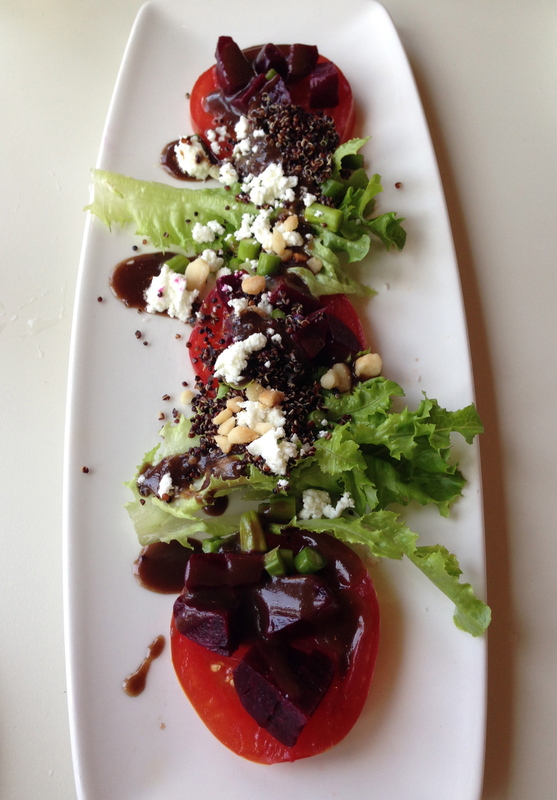 She also ordered a salad for her lunch—exactly how a child’s taste buds should be. Makawao in Upcountry Maui feels laid-back and trendy at the same time. This is the town of cowboys, galleries, interesting shops. It’s a great place to wander for a morning or an afternoon. The people seemed genuine and friendly and when it was time to look for a lunch spot, we picked a place with a generic-sounding name—Market Fresh Bistro. 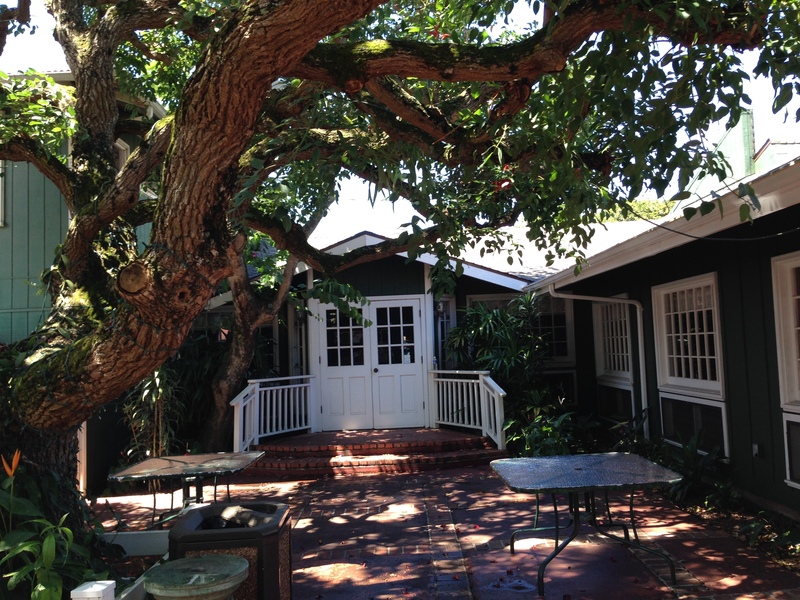 Located at 3620 Baldwin Avenue, tucked in an area behind the Viewpoints Gallery and a charming walkway and courtyard, this bistro was one of our favorite finds during a week in Maui. 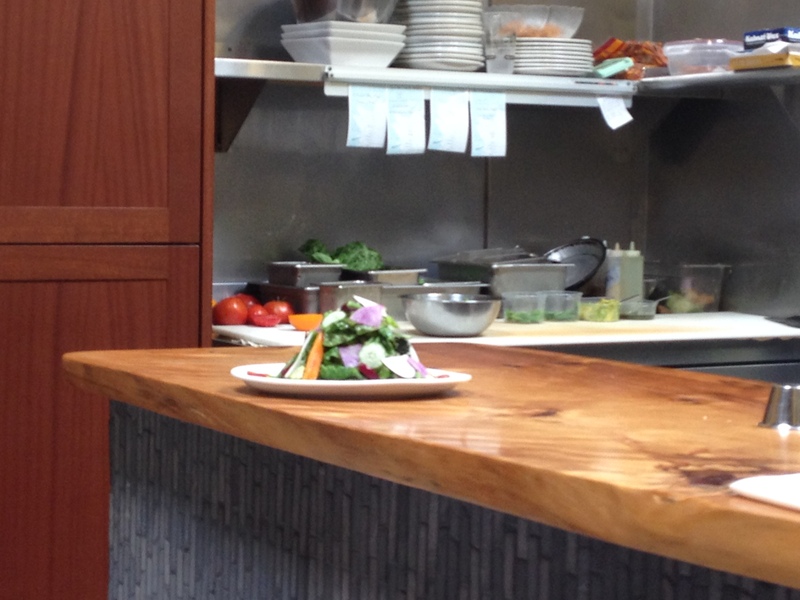 The food here is organic, unbelievably fresh and prepared simply, ensuing that the ingredients shine. 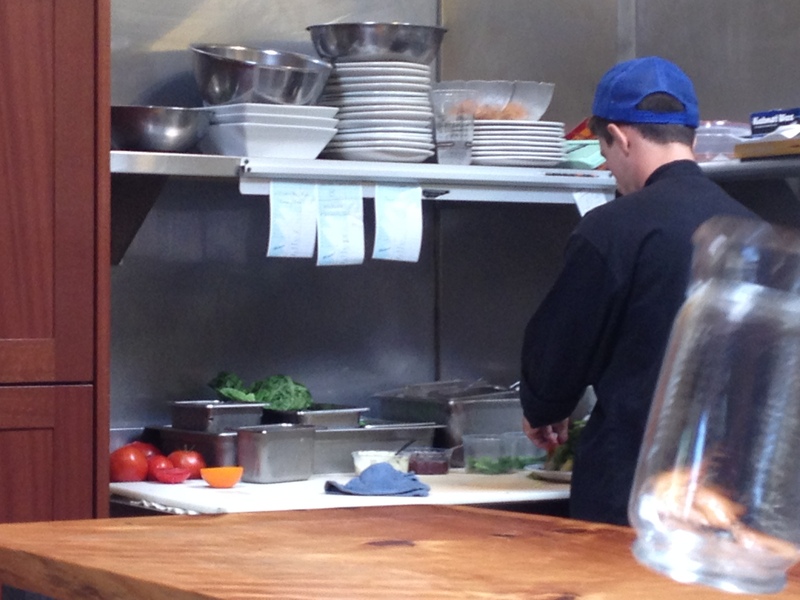 When we ordered a salad for our lunch, we sat in awe as we watched the kitchen staff carrying in the fresh greens and other produce for our meal. The freshness of the local produce and fish we enjoyed that day were unbelievable. The soup was interesting and flavorful. With fresh fish as an option to top a salad, the lunch felt healthy, fresh and light. The presentation was beautiful. I only wish I could prepare a salad so beautiful at home. Our service was friendly and casual. We enjoyed a glass of wine and a leisurely pace as we admired the creations being made before our eyes in the open kitchen. 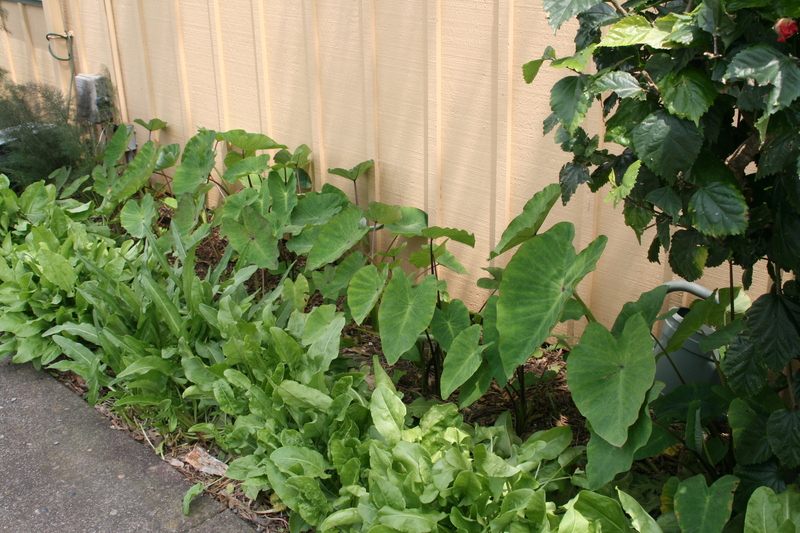 Market Fresh Bistro’s garden-fresh ingredients left us longing for something similar in our neighborhood at home. If only we could get produce this fresh year-round. This bistro is locavore heaven. Highly recommend. Next time we’ll try the dessert. Since it’s almost Friday and much of the country is stuck in Polar Vortex 2, it seems like an appropriate time to profess my love for Monkeypod Kitchen on Maui. 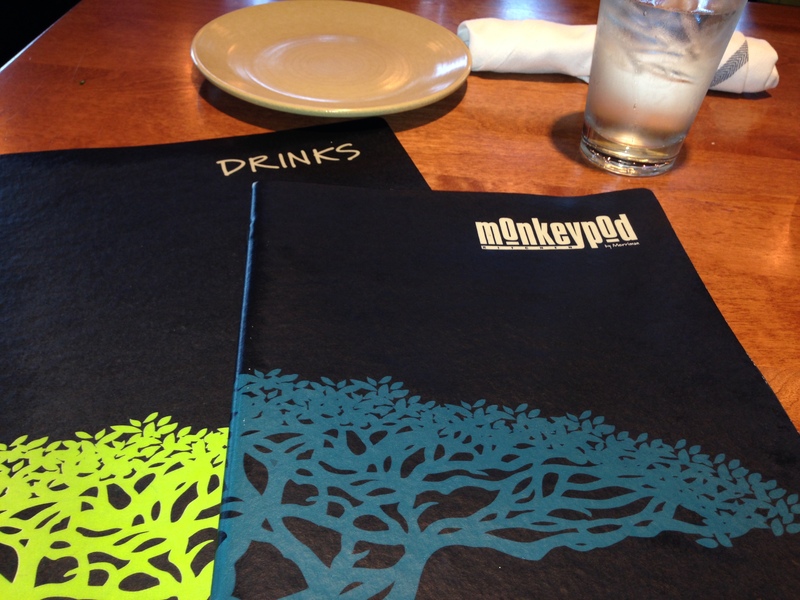 Oh, how I wish there was a Monkeypod Kitchen just down the street. And that it was 78 and sunny with a light tropical breeze. 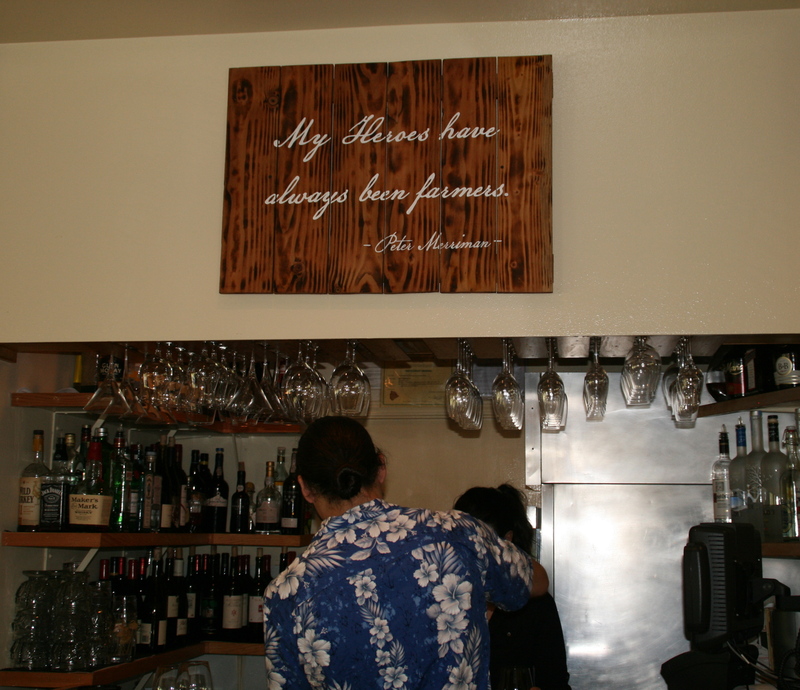 Peter Merriman is one Hawaii’s most recognized, celebrated and well-known restaurateurs. Credited for developing the locavore concept in food, his work to elevate the farm to table concept is a big contribution to Hawaiian cuisine–and to locally grown, harvested and simply prepared foods all over the world. After a tip from a server at Merriman’s in Kapalua, we made a beeline to Monkeypod Kitchen to burn off that awkward time when you have to check out of your hotel (weeping) and it’s much too early to sit at the airport in Hawaii when it’s so incredibly gorgeous everywhere you look. So, off to Monkeypod Kitchen for happy hour we went. Wow. This place puts the happy into happy hour. 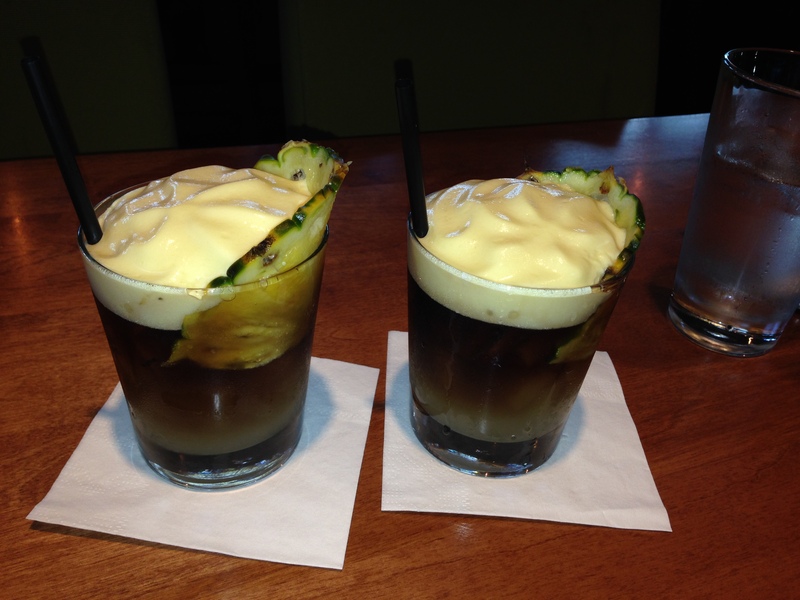 For starters, there is the Monkeypod Mai Tai. Old Lahaina light rum, Maui dark rum, lime, orgeat, orange curacao, honey-lilikoi foam. Did I mention honey-lilikoi foam? Unbelievable. Luckily, I wasn’t driving to the airport. The handcrafted culinary cocktails are imaginative, reflective of the Hawaiian setting and yummy. What’s not to like? Then, there are the appetizers and salads. 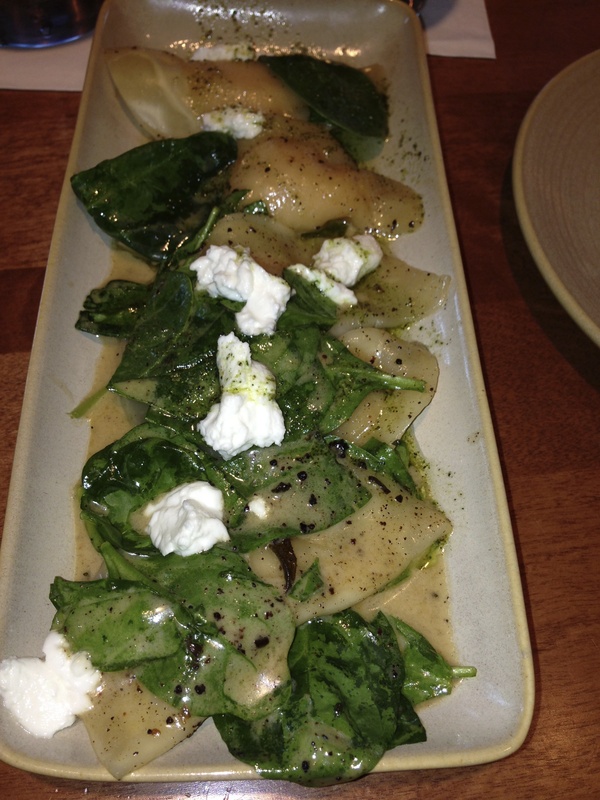 The pumpkin patch ravioli was delicious and more than enough to share. 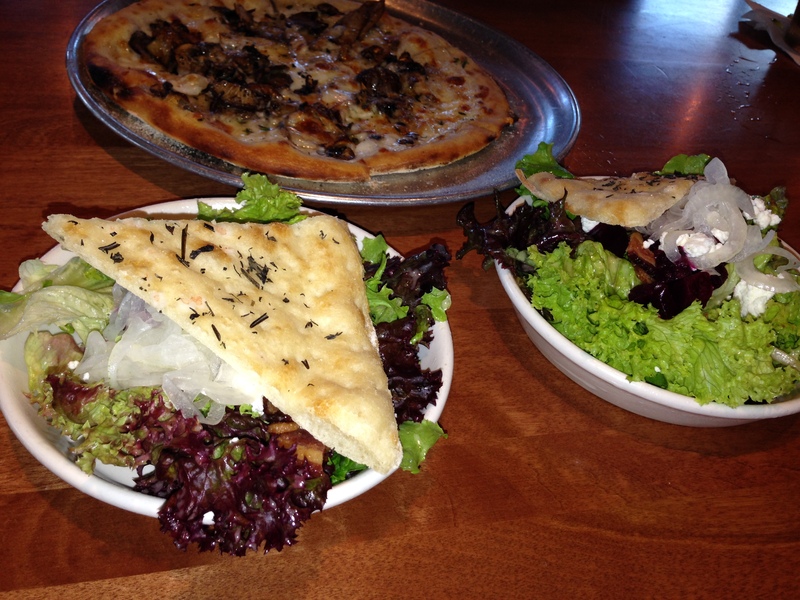 The wood fired pizzas were hand tossed and with a variety to choose from such as Hamakua wild mushroom & truffle, roasted butternut squash, bourgeois with Big Island lobster, mushrooms, white sauce, parmesan, thyme. To top it off, they had live Hawaiian music and a beer list featuring high-quality brews from top breweries and microbreweries from around the world. Although I am not a beer expert or a beer drinker, I know quality and selection when I see it. Gotta go! Time to search for some flights to Hawaii. When we discovered that there was a dairy on the island of Maui, I could hardly believe our good fortune. After all, my favorite food groups are the three Cs: chocolate, cabernet and cheese. 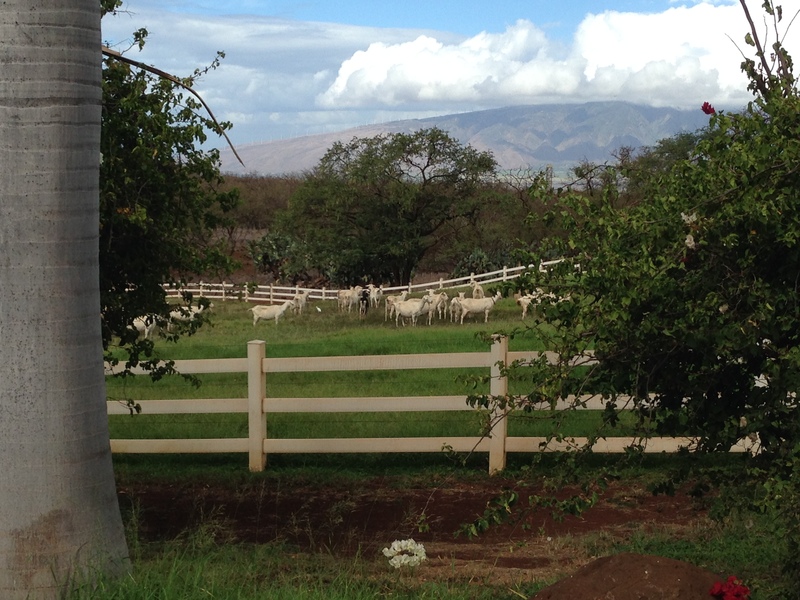 So, after a morning of watching the sunrise at Haleakala National Park, and a tour of a lavender farm, we drove to the Surfing Goat Dairy in Upcountry Maui. 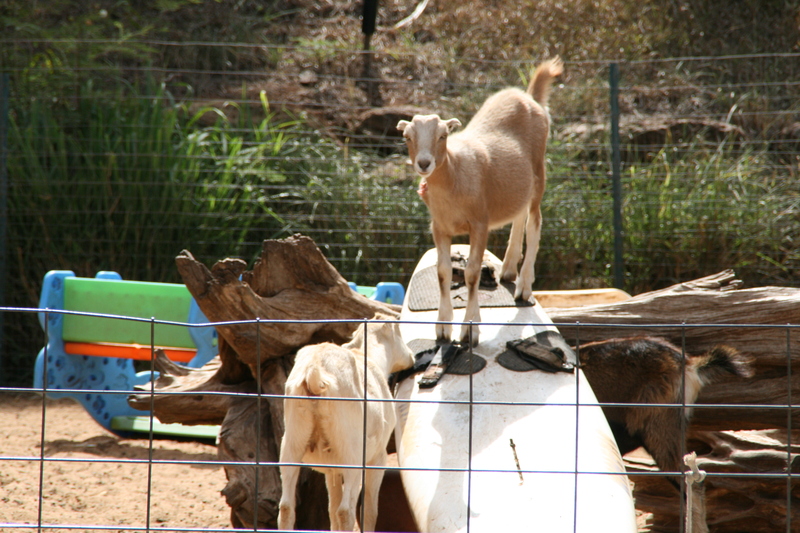 Surfing Goat Dairy produces and sells award-winning cheeses and offers visitors on Maui a variety of tours. The people we met were welcoming and seemed to truly love their jobs. We took a casual tour, which for a fee of $10 included a personalized tour of the entire operation. We were able to see the goats, feed them, view the milking and cheese-making areas and taste a variety of the gourmet goat cheeses. The first impression of this dairy is how well these animals are lovingly cared for. The dairy is Certified Humane Raised & Handled, which means that they don’t use any pesticides or herbicides and the goats have resting areas, shelter and sufficient space to engage in natural goat behaviors. They also name each goat in the herd after birth. 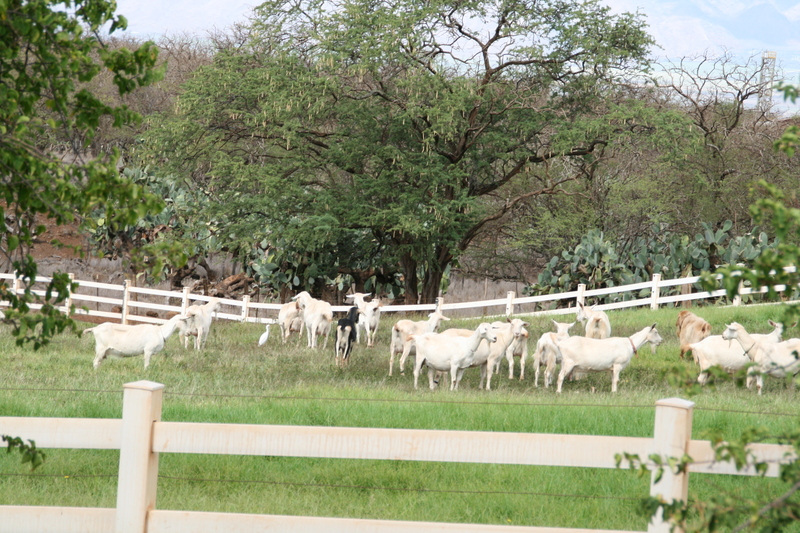 Plus, as a bonus these goats get to live on Maui. German expatriates Thomas and Eva Kafsack own and operate the dairy. We learned that they moved to Maui more than a decade ago after leaving their previous professions. He led a software company and she taught high-school German in Germany. They brought with them the knowledge gained from visiting dairies throughout Germany, Austria and France. The goats are milked twice a day, and then the milk is immediately pasteurized at a temperature designed to ensure that the vitamins are not harmed. It is then cooled down quickly for the cheese making. After adding organic cheese cultures and a vegetable rennet, they produce three types of cheeses: soft cheese, fresh chevre and quark, which is a European-style cheese also known as fromage blanc and has a consistency between yogurt and cream cheese. The chevre cheeses were delicious and we found these cheeses frequently on the menus of many Maui restaurants. The list of hotel customers is impressive and includes the Ritz Carlton Kapalua and the Four Seasons in Wailea on Maui, the Four Seasons Resort Hualalai on the Big Island and a number of mainland hotels such as the Peninsula Beverly Hills and the Arizona Biltmore Hotel. The best surprise was a gourmet chevre called Men’s Challenge, which won a second place National Award in 2004 and would be a perfect substitute for horseradish for a holiday meal. The fruit quark was made with fresh organic fruits such as Kula strawberries, lilikoi and apple bananas. The aged Maui gourmet goat cheese comes in tempting flavors such as Napa Wrap (fresh chevre wrapped in grape leaves), MacGoatNut, Swedish Heart (caraway seeds in black cheese wax) and French Dream (herbes de Provence, in white wax). Their feta, plain and ripened five months in brine and olive oil, won a first place National Award in 2006. 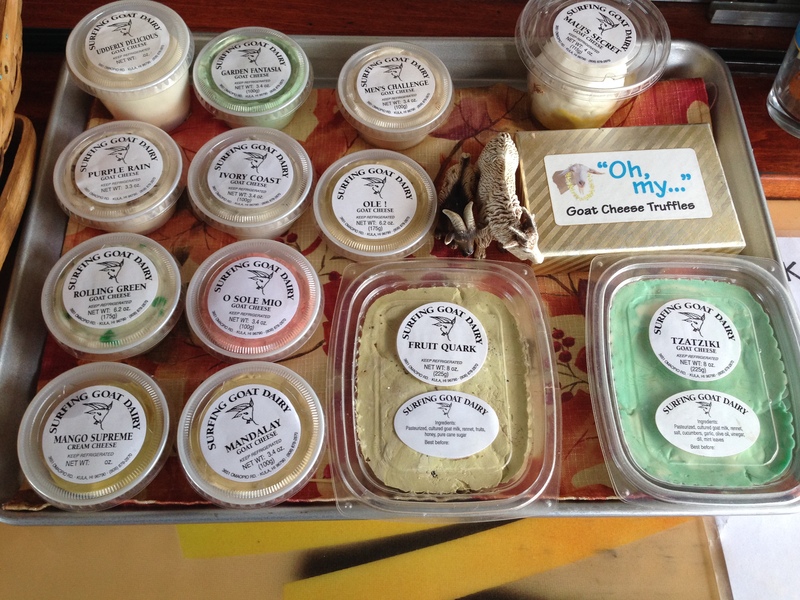 Oh, and did I mention that they also make gourmet goat cheese truffles in flavors like toasted coconut, lychee, lilikoi, Hawaiian chili pepper and lavender? 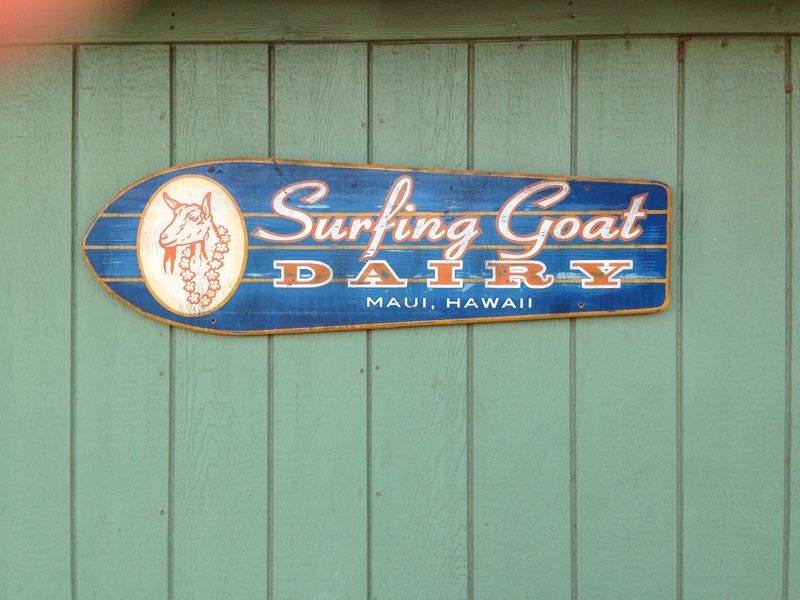 From Kula, Surfing Goat Dairy is located 3.6 miles down Highway 37. Some things are just meant to be together–the perfect combination. Like Sundays and a tropical brunch. Why not start it out with a glass of passionfruit, orange and guava juice, or POG as it’s called in Maui where the combination was created in the 1970s? 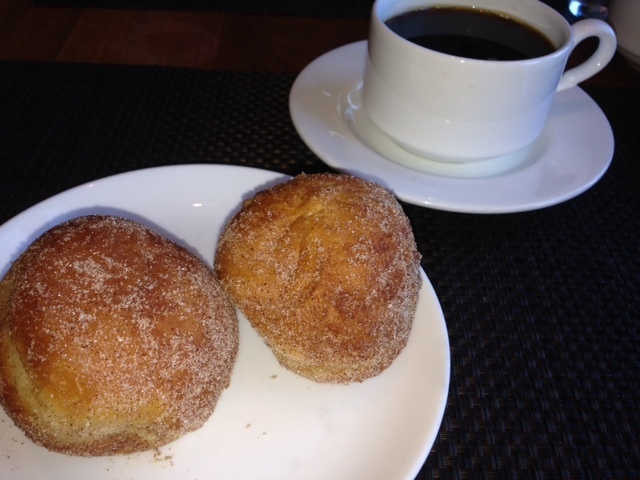 Followed by another perfect combination of Kona coffee and malasadas. 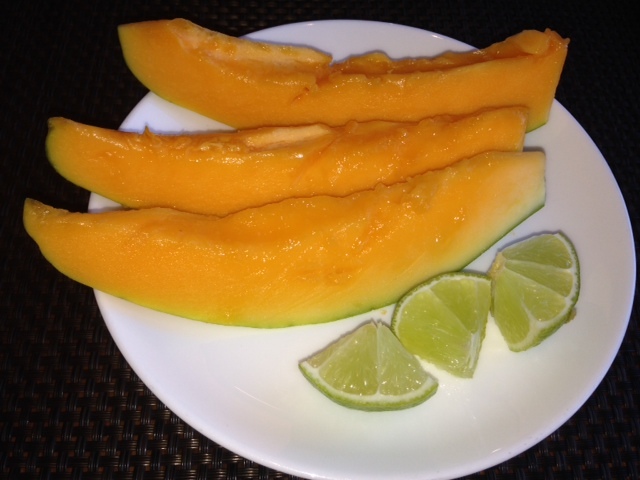 Or, perhaps refreshing papaya and lime juice? 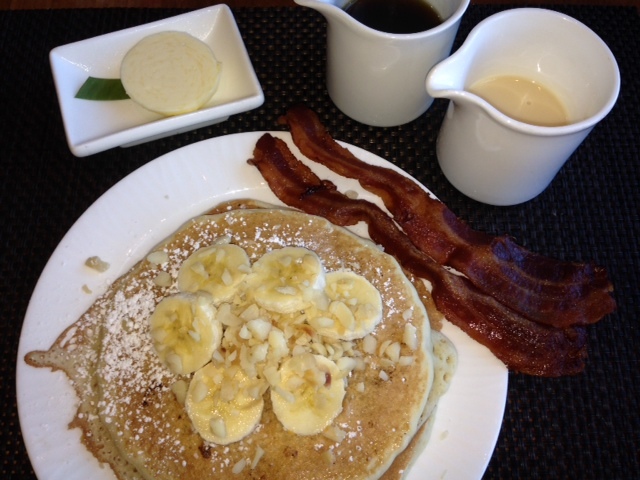 Topped off with one of the best tropical combinations ever: a pancake with macadamia nuts, bananas and coconut syrup. Then, it might be time to hit the hiking trails. Or, since it’s Sunday another perfect combination might be calling you? 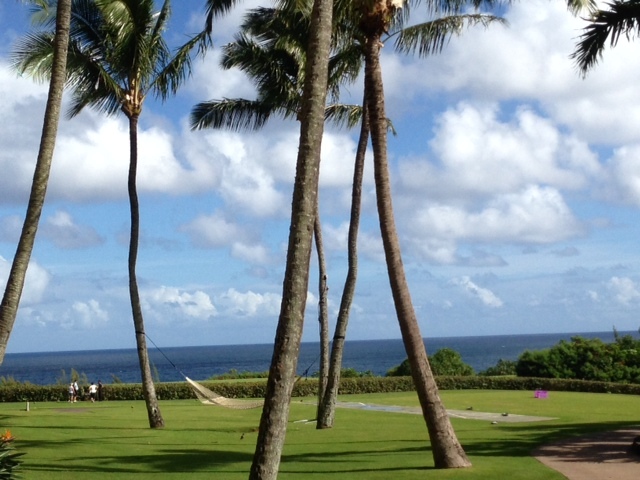 A hammock between two palm trees with an ocean view. 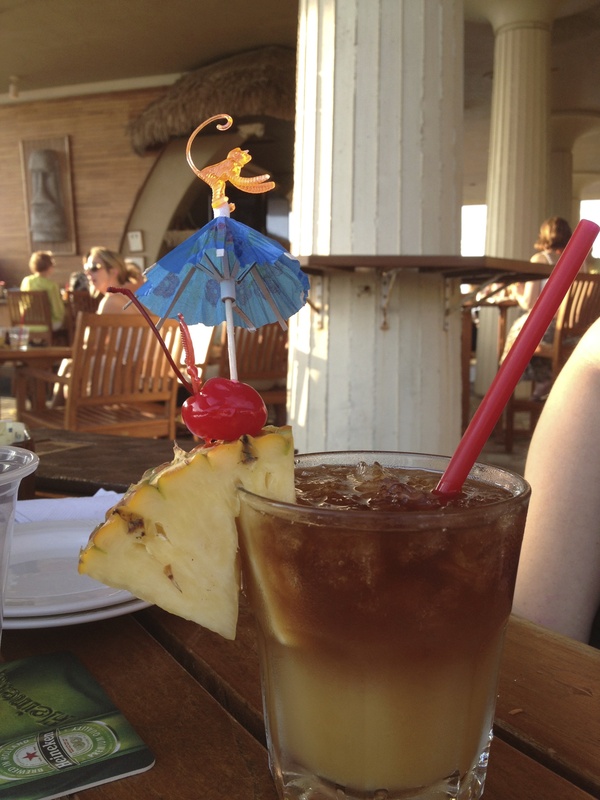 It’s the one cocktail mainlanders usually think of when we dream of Hawaii—the mai tai. Usually two different types of rum, pineapple juice, lime juice, orange Curacao and definitely an umbrella with a slice of island pineapple. The truth is, I’m not much of a cocktail fan at all. I much prefer a glass of wine with dinner. When in Hawaii, however, it’s irresistible. The ocean, a light breeze, a schedule on Hawaiian time. No hurry whatsoever. Pull up a chair, order one up and stay a while. While you’re at it, watch the sunset and hope for the ever-elusive green flash. 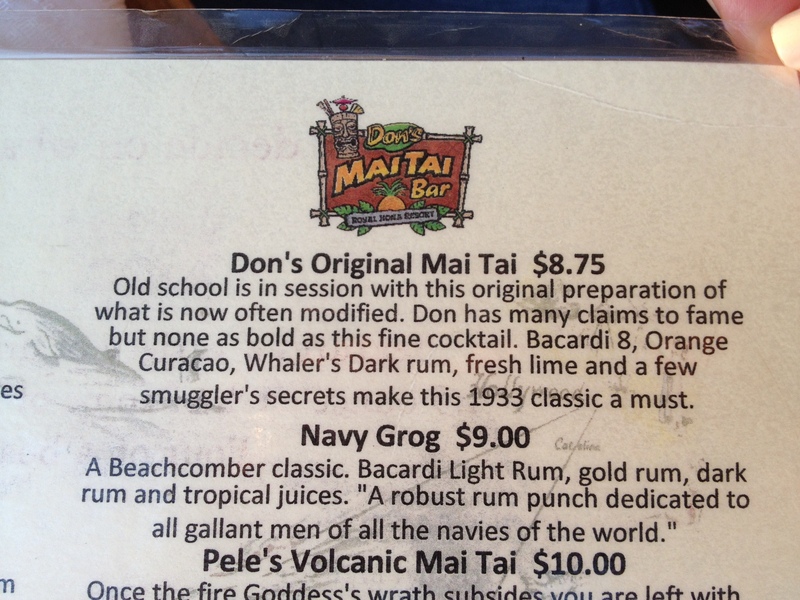 Here’s the mai tai at the classic Don’s Mai Tai Bar in the Royal Kona Resort in Kailua-Kona. An oceanfront, open-air spot in Kailua Bay offering up Don’s Original Mai Tai and other Hawaiian cocktail options. It’s five o’clock somewhere, right? One of my favorite things to do when returning from Hawaii is to bring a taste of the islands home with us. Whether it’s macadamia nuts, special Hawaiian spices, coconut syrups, Kona coffee, decadent Maui Caramacs (yum!) and more. The options are endless. We love to give away a taste of Hawaii to friends and family, but we also like to keep a secret stash in the home pantry. 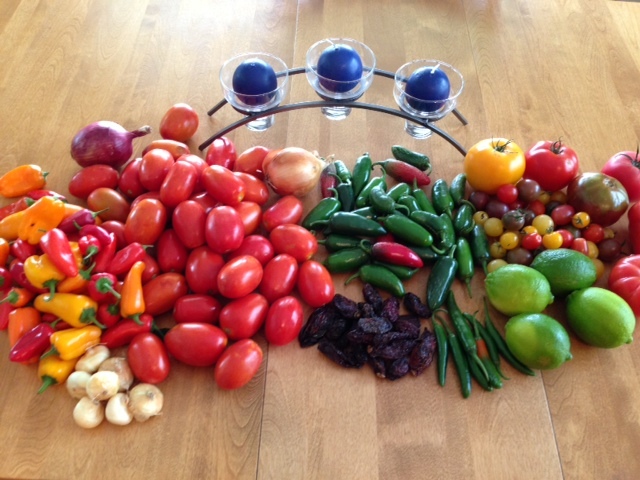 Today, my husband is making fresh salsa. We stopped by our local farmers’ market for the tomatoes, peppers, onions and cilantro. Then, we couldn’t believe our good fortune when we remembered the special Ono Hawaiian seasoning we had purchased last March. We use this for all kinds of recipes instead of regular or kosher salt, so why not give it a try with a tiny pinch thrown in each batch. 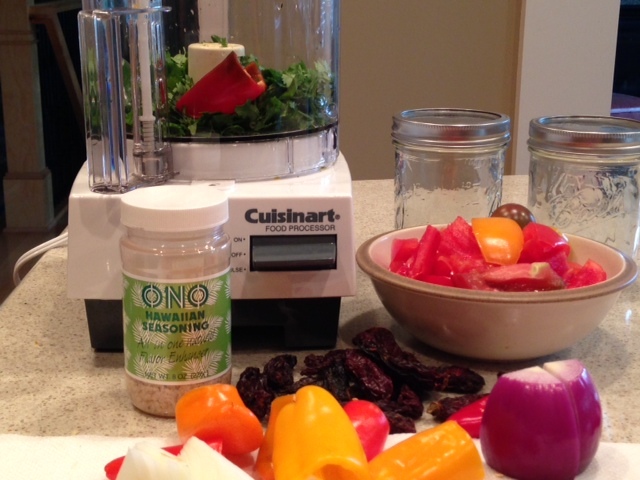 Who would have thought that homemade salsa could taste even better with a touch of aloha? It doesn’t get much better than outdoor dining in Hawaii, especially when you know it’s snowing at home. Or, anytime really. 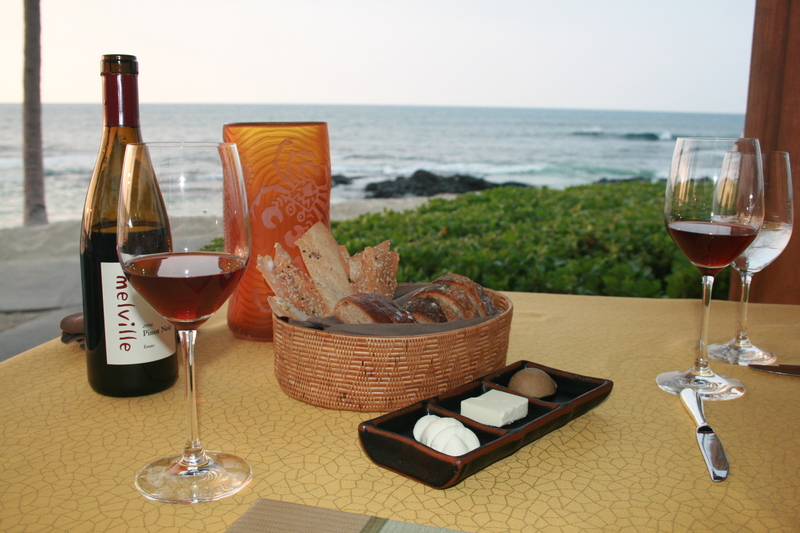 This was a special anniversary meal at Hualalai on the Big Island. As close to dining on the beach as you ever will find with the perfect view of the sunset. Somehow, a great meal turns unforgettable with the sound of waves and a beachside setting. Aloha. 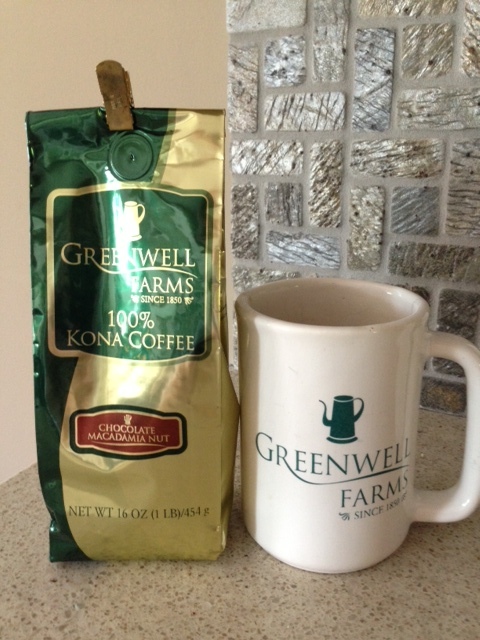 For most coffee lovers, a cup of 100 percent Kona coffee will be love at first sip. The smell of Kona coffee brewing is enough to get you hooked. 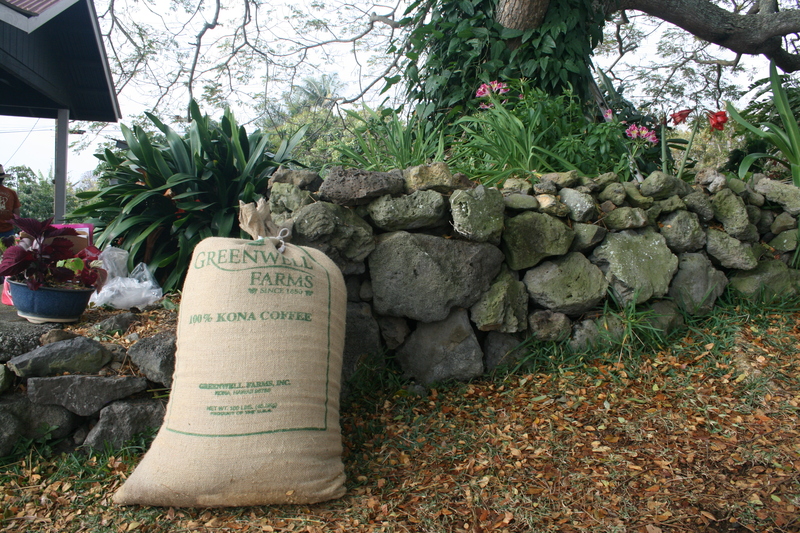 Kona coffee is the official name for coffee grown in the North and South Kona districts on the Big Island. The weather in this region is apparently ideal for growing the coffee, with the volcanic soil and sunny days with a mix of light clouds in the afternoon. Other islands grow and produce coffee, but the Big Island is the home of pure Kona coffee. A fun way to spend an afternoon is to go coffee tasting, sort of like wine tasting in Napa or Sonoma except you don’t need a designated driver. 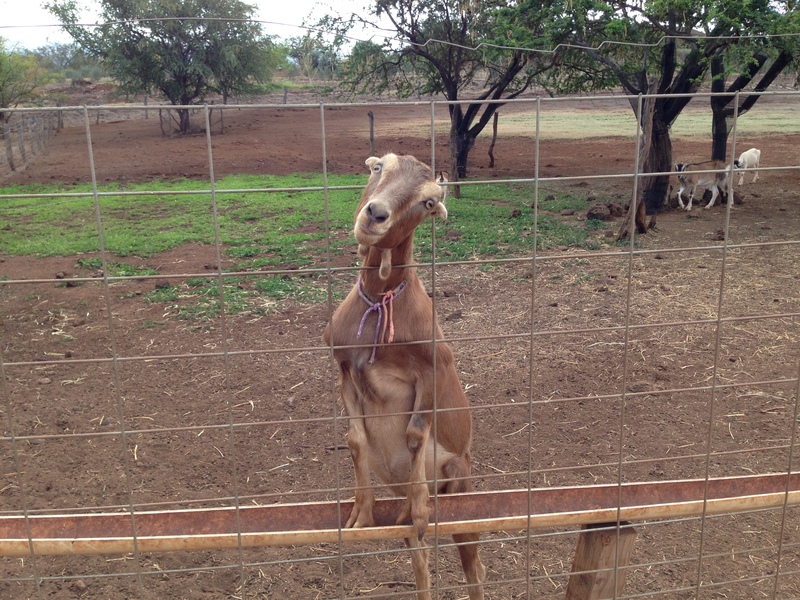 On our first trip to the Big Island, we discovered Greenwell Farms. We have since been back to visit and our tour guide was once from our home state. We were hooked and have been members of the Greenwell Farms coffee club since—sort of like a wine club, except you don’t need to worry about your shipment freezing in our frigid winters. We get a quarterly shipment of chocolate macadamia nut coffee. In the middle of January, it’s heaven in a cup. There are many wonderful coffee farms to visit. Many of them are located on the Mamalahoa Highway 11, south of Kona and hear the Holualoa area. Many of the farms will offer tours, which are well worth the time, often provide a scenic view of the ocean in the distance, and will make you want to sit and sip and stay a while. 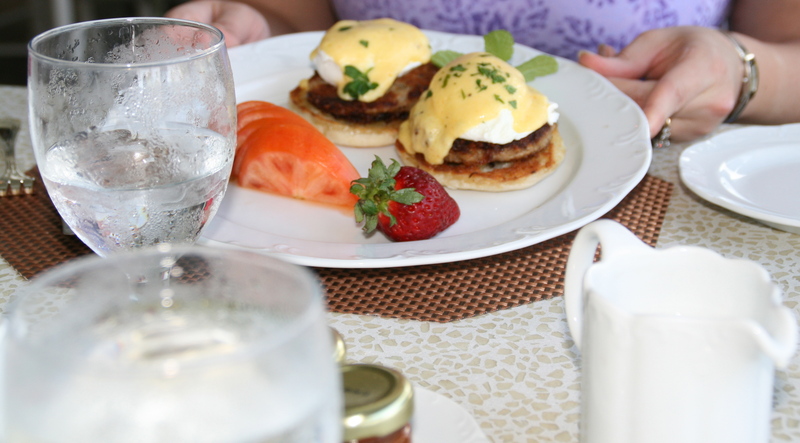 In March 2012, we biked for 10 miles plus so that we could enjoy the delicious breakfast and brunch at the Bay Terrace at the Mauna Lani Hotel on the Big Island. With its outdoor tables overlooking the gorgeous grounds, pool and ocean, you can’t go wrong. 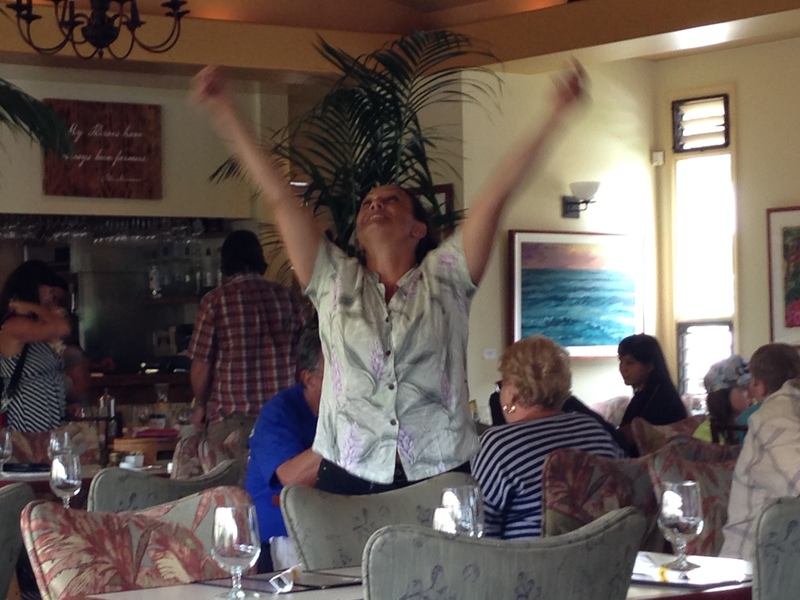 We get the sense that many of the waiters and waitresses have worked at the Mauna Lani for years. Since this is the type of place that people seem to return to year after year, it wouldn’t surprise me if they eventually learned your name and waited for your return. 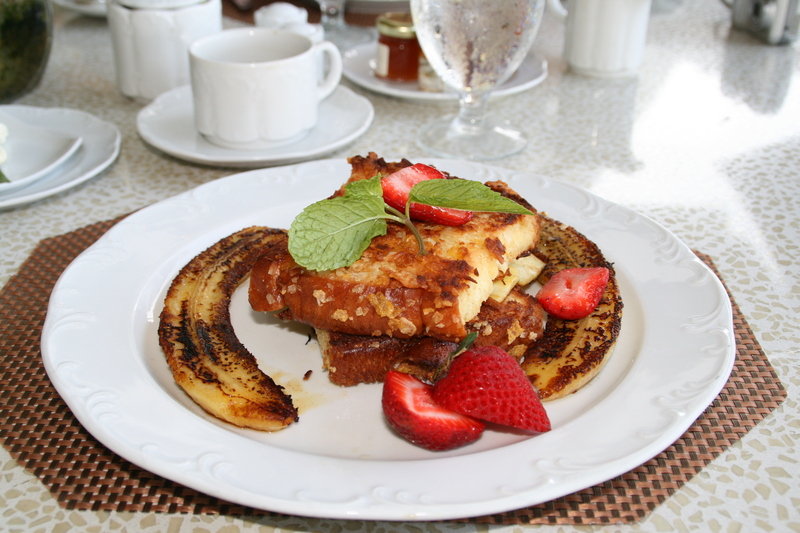 We enjoyed the Hawaiian-inspired eggs benedict and coconut French toast with bananas. So tropical and so delicious. 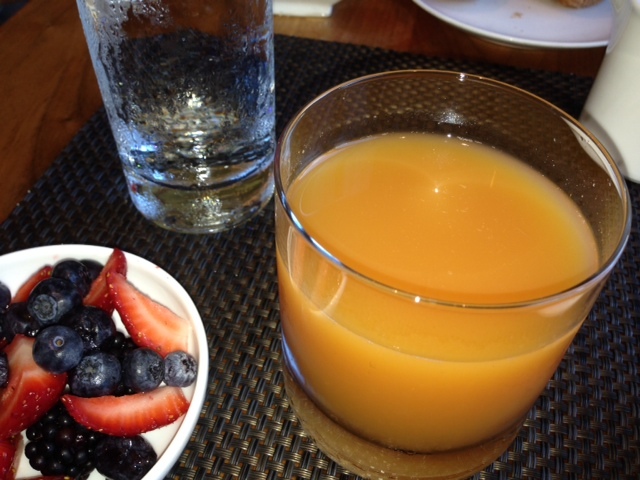 Paired with a freshly brewed cup of Kona coffee, it’s perfect for a Sunday brunch. Or Monday, Tuesday, Wednesday, Thursday, Friday or Saturday. Good morning, paradise.